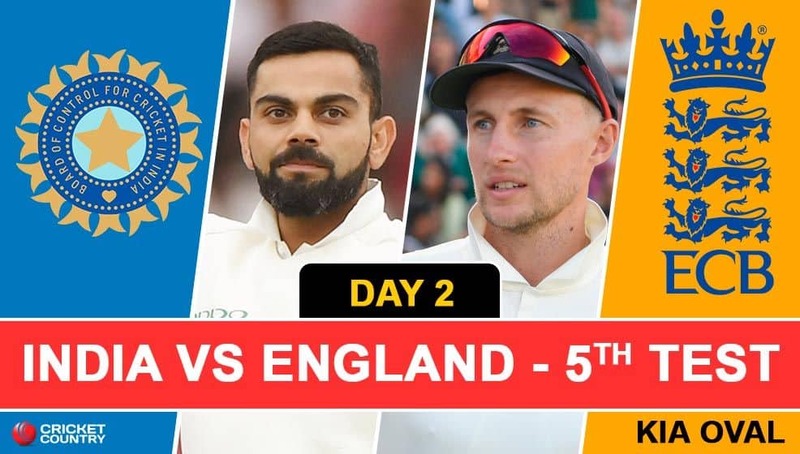 Follow the live score and updates from the Day 2 of the fifth and final Test between India and England at Kennington Oval. And that’s stumps. India 174/6, trail England (332) by 158 runs. Virat Kohli 49, KL Rahul and Cheteshwar Pujara 37 each. Hanuma Vihari is on 25. 2/20 for James Anderson, 2/44 for Ben Stokes, 1/25 for Staurt Broad and 1/46 for Sam Curran. England lifted themselves from 198 for seven on Day 1 to 332 and have came back strongly to leave India in a spot of bother at 174/6. England day, you would think? WICKET! Top Delivery from Sam Curran to get rid of KL RAhul for 37. India 70/2. In walks Indian skipper Virat Kohli. What an absolute peach. Take a bow, Sam Curran. Rahul is beaten all ends up here. He gets a length ball which lands on middle and off and it goes with the angle from over the wicket. Rahul plays inside the line and the ball goes past the bat and clips the top of off pole. England is ecstatic and rightly so. Rahul was looking dangerous and he has been sent back packing. Hello all. Welcome to CricketCountry‘s live coverage of Day 2 of the fifth Test between India and England at the Oval. After two attritional sessions on Friday, Indian seam bowlers staged a wonderful comeback, restricting England to 198/7 from a strong position of 133/1. Alastair Cook, who looked determined to finish his Test career with a hundred, fell 29 short of it. His dismissal triggered a collpase and making the most of it was Ishant Sharma, who shred England’s middle order and finished Day 1 with figures of 3/28. Moeen Ali played a dour innings of 50, off 170 balls, but once he went, it seemed to signal the end of the innings. But Jos Buttler, England’s leading run-scorer this series, along with Rashid Ali ensured England did not lose another. Plenty would be expected of Buttler on Day 2. Stay tuned. Live action is half an hour away.